The International Atomic Energy Agency’s (IAEA) Specific Safety Guide No. SSG-11 which relates to Radiation Safety in Industrial Radiography states that radiography companies must ensure that employees (Category A Workers and potentially others who enter controlled areas) are subject to regular dose assessments in order to ensure that radiation doses are kept as low as reasonably achievable and dose limits are not exceeded. It is essential that reliable dose information is collected to ensure that the exposure of workers is properly controlled. Furthermore, dose assessments will also serve to highlight bad (and good) working practices. To meet this requirement, the employer will engage an Approved Dosimetry Service (ADS) so that they may provide suitable personal dosimeters together with a formal dose record keeping service. 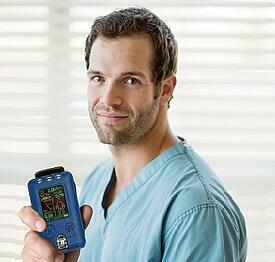 For legislative compliance, legal dosimeters used by radiographers are normally passive. These include Thermoluminescent Dosimeters (TLDs), Optically Stimulated Luminescence Dosimeters (OSLs) and to a lesser extent recently, film badges. In addition to passive dosimeters, employers of Class A personnel, where individuals could potentially find themselves working with high activity sources or in high dose rate areas, have chosen to utilise active personal dosimeters in order to complement more traditional methods of dose assessment. What is Active Personal Dosimetry? The employer should provide a suitable secure storage location for dosimeters not in use, ensuring the badges themselves are not exposed to radiation levels above that of background. Avoid storage in overalls, emergency kits, tool boxes or other locations where they may inadvertently be exposed to ionising radiation when not being worn. Avoid passing badges through x-ray security units such as airport x-ray baggage inspection units (particularly the larger higher output hold luggage units) or mail/package inspection units. If a dosimeter has been lost, damaged or mislaid, provide details to the ADS as soon as possible. Investigate any lost, damaged or mislaid dosimeter in order to estimate the dose for the wear period. Often this will involve the Radiation Protection Adviser (RPA) / Qualified Expert. When/if required, request that the ADS include any estimated dose be recorded in an individual’s dose record. At this time the ADS should be supplied with a summary of the investigation. If an estimate cannot be made or indeed is not provided by the employer, then a notional dose will be recorded in the individual’s dose record (this should be a last resort). Audible and vibrational dose and dose rate alarms which may be set as high or low as the user sees fit. Multiple users may be assigned. Off-body mode enabling the device to be used as a dose rate monitor as well as a personal dosimeter. Intrinsically safe PEDs are available for use in potentially hazardous areas without the need for a permit. Over the years there have been a number of incidents whereby radiographers have received significant doses which may have been prevented if personal electronic dosimeters had been worn. In conventional gamma radiography it is essential that a gamma dose rate monitor is used to confirm that a source has been fully retracted into its shielded container. In some instances, this may not be enough to prevent exposures. The following incidents, taken from the OTHEA website, highlight the importance of active personal dosimetry/personal bleepers in both complimenting passive personal dosimetry and also in incident prevention. Following a radiography exposure, a radiography source (550GBq Iridium-192) was wound back to its shielded container. As required by the operator’s procedures, a dose rate monitor was used to confirm that the source had returned to its container. Although there was a significant drop in the measured dose rate, suggesting that the source had been fully retracted, when the equipment was next used, five days later, the radiographers were alarmed to find that the source was absent from its container and had actually become dislodged from the guide tube during dismantling. The subsequent investigation identified that the drop in dose rate was due to the source falling from the guide tube and coming to rest close to the shielded container, which itself offered shielding from the source. Once located, the source was recovered by the Radiation Protection Supervisor (RPS). 2 people received a dose between 100 and 150mSv. 4 people received a dose between 30 and 100mSv. 9 people received a dose between 11 and 30mSv. and 63 people received a dose of less than 11mSv. It should be noted that doses could have been far worse if the source had remained in an uncontrolled state for longer. Furthermore, as the source was fairly accessible, it could have been easily picked up during the five-day period which could have led to deterministic effects (skin burns) and possible fatalities. Lost or detached radiography sources are normally the result of wear of the joint between the wind-out cable and source pigtail. It is therefore essential that radiographers have a suitable programme of inspection and preventative maintenance of their equipment. The use of an PED (active personal dosimetry) would have alerted the radiographer to the mislaid source and most probably significantly reduced both doses received, as well as the number of people exposed. This incident occurred on a construction site when a two-man radiography team, using a 1.85 TBq iridium-192 source performed three radiographs before one of the team realised that the source had actually remained at the end of the wind-out tube for all three of the exposures. That is, it had never returned to its shielded container between each exposure. Following the exposures, the contingency plan to recover the source was instigated by the radiographers. Both radiographers were wearing passive personal dosimeters and as such did not have an alarm function. The subsequent investigation, which involved a reconstruction of the incident, concluded that the source pigtail had not been connected to the wind-out cable by the radiographer and the source had been simply pushed to the end of the guide tube where it remained for the three exposures. During repositioning of the guide tube and film replacements, the lead radiography would have been in close proximity to the source. Lead radiographer – effective (whole body) dose: 43 mSv, dose to hands: 200 mSv. 2nd radiographer – effective (whole body) dose: 2.9 mSv, dose to hands: 3 mSv. These estimated doses could have been prevented if dose rate monitoring had been undertaken after each exposure. Furthermore, the wearing of a suitable personal alarm monitor would have identified that the source had not returned to its shielded container after each shot. Compound gamma radiography was being performed using a 1 TBq iridium-192 source. The compound relied on an automated wind-out system to expose and retract the source. The enclosure’s door was not interlocked and there was no radiation monitor installed within the enclosure to indicate that the source was exposed. The radiographer simply relied on a hand held instrument to check radiation levels inside the room. The exposed radiographer wore a passive dosimeter (TLD) but not a PED (although these were available). During his shift the radiographer assumed that the previous exposure had finished and consequently used a dose rate monitor to check radiation levels inside the room. Since the monitor showed no response it was assumed that the source had been retracted and the radiographer proceeded to set up for the next shot. After leaving the enclosure he noticed that the automatic wind-out mechanism had failed to initiate the exposure and both the warning and indicator lights on the unit were not working. Furthermore, the equipment’s distance counter indicated that the source was somewhere between the collimator and shielded container. The radiographer again used his dose rate monitor to measure radiation levels at the enclose door and again this showed no response. The radiographer then proceeded to disconnect the automatic exposure system and attempted to manually expose the source. It was only then that he realised that the source had not been properly retracted after the previous shot and also that his dose rate monitor was not working (flat batteries). Effective (whole body) dose: 43 mSv. Equivalent (skin) dose: 51 mSv. The subsequent investigation concluded that the main cause of the incident was failure of the automated wind-out mechanism to retract the source back into its shielded container. The system should have been configured so that when switched off, the source is fully retracted into its shielded container. This incident highlights the importance for regular servicing and preventative maintenance and also the need for regular checks on equipment engineering controls and safety devices. It also highlights the importance of training of employees and the need to work to site local rules (radiation procedures). The wearing of a PED as provided by the employer would have alerted the radiographer to the presence of high dose rates and as such this is one of the reasons why such dosimeters are strongly recommended. During a recent workshop  for Radiation Protection Advisers/Qualified Experts which was run by the main regulator in the UK for those working with sources of ionising radiation (The Health and Safety Executive (HSE)) it was specifically stated that they would expect radiographers to wear PEDs/bleepers in parallel with passive dosimeters. This is especially true when using gamma sources. PEDs have a number of advantages over passive dosimetry. As stated earlier, they can alarm at a pre-set dose or dose rate, they give an immediate indication of accumulated dose (and dose rate) so no time delays in processing the dosimeters, they can be linked to specific tasks and can be used by multiple users. There are of course disadvantages with using PEDs. These include cost, which is significantly higher than passive dosimeters, they are sometimes much larger in size, weight can be an issue and of course they do require a power supply (batteries). Tracerco offer a range Personal Electronic Dosimeters (PEDs) that have been designed to be the easiest personal radiation monitors on the market to use and understand. All of our PEDs include weather, shock and drop proof housings, a smooth clean design and simple and easy to use software. To find out how our range of PEDs can provide you with a simple, intuitive and convenient radiation monitoring solution for all your radiation monitoring and management needs, book a demo today. The International Atomic Energy Agency’s Specific Safety Guide No. SSG-11, Radiation Safety in Industrial Radiography. The Health and Safety Executive (HSE) Workshop for RPAs to Industrial Radiography Sector, HSE Bootle, 4th April 2017. The Health and Safety Executive information sheet – Industrial radiography – managing radiation risks, Ionising Radiation Protection Series No. 1. Health and Safety Executive information sheet – Radiation doses – assessment and recording, Ionising Radiation Protection Series No. 2.